Most people probably just delete spam they receive or install a filter to attempt to block it but that really doesn’t do anything to help prevent future spam. By the time spam reaches your inbox it has already traveled through several mail servers on the internet wasting bandwidth and resources along the way, and most importantly wasting your time when you receive it. The best thing you can do is report the spam to the ISP where it originated from so they can take actions to disconnect the offending IP address to stop further spam. In the past I reported spam manually by looking at the headers and finding the originating IP address then doing a whois lookup to determine who owns the IP address. This process can be time consuming, so why not utilize a tool to automate the process? This is where spamcop comes in. You’ll need to register for a free account before you can start reporting spam. 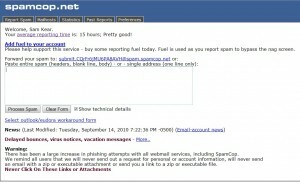 Using spamcop you can report spam a couple of different ways. 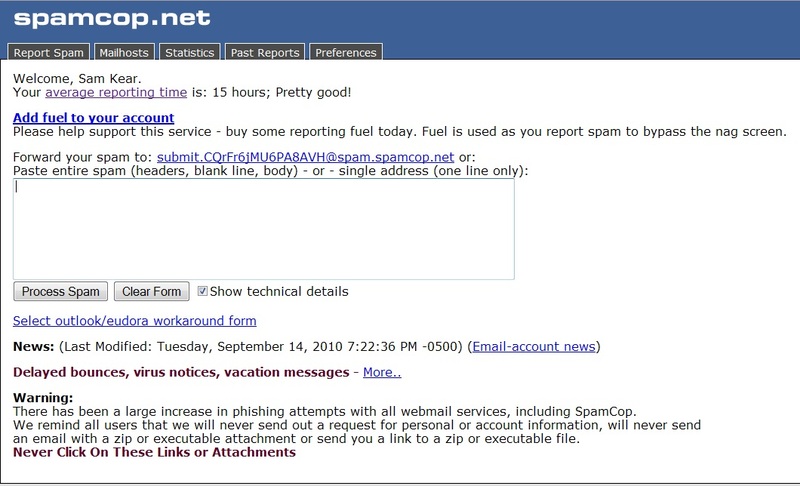 Once you’ve submitted a message to spamcop it will analyze the message headers and contents gathering interesting information about the message. Before your spam report is submitted you’ll need to review the report. Spamcop will attempt to find contacts for the originating ISP and also the host of the spamvertised site in the message contents if one exists. Spamcop will submit the report directly to the ISP of the spammer. Once the report is submitted you will receive a URL to track the report with, a history of your past reports is saved in your spamcop account. Occasionally I will receive a short note from an ISP saying thanks or indicating that they have taken some action on their part. Reviewing the reports that spamcop creates and the logic behind its analysis is a great way to learn more about tracing spam. Sam consistently puts up high quality posts that are succinct and helpful. Well-done! Thanks for your comments Kevin.